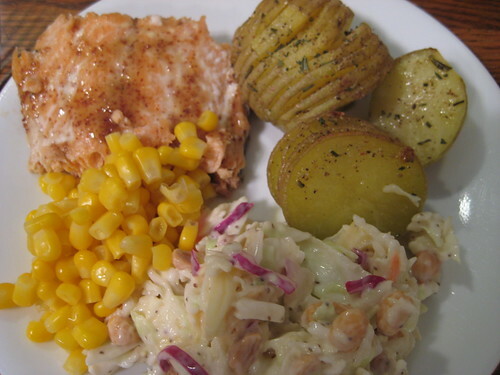 Supper last night was salmon, accordion potatoes, corn and coleslaw. I added peanuts and apples to the coleslaw, which was tasty. The salmon was baked with honey and dijon mustard brushed on it. Very good! 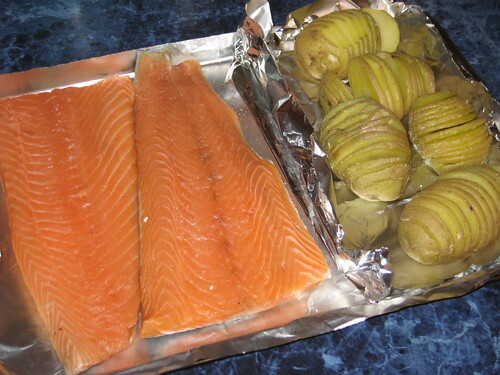 I had planned to make corn pudding, but decided against it, as I was already using the oven to bake the salmon and the potatoes. 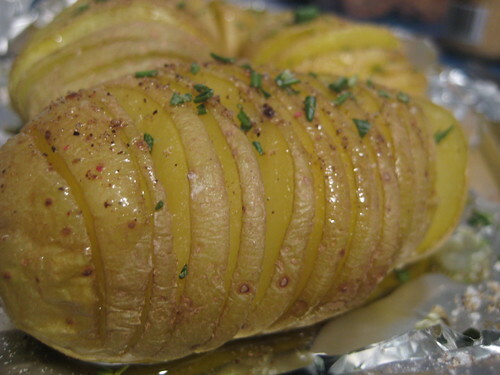 The accordion potatoes recipe came from the What’s for Dinner? blog. I used five medium Yukon Gold potatoes, and, after slicing them, covered them with a paper towel and baked them in the microwave for six minutes. I didn’t have fresh thyme, so put fresh rosemary on them, along with the olive oil, salt and pepper. I then baked them in the oven with the salmon. They took a few more minutes than the salmon, so were probably in the oven about 20 minutes at 400*. If supper hadn’t been so late (didn’t eat until 7:30) I would have put the potatoes under the broiler until they crisped on top. As it was, everyone was hungry, so supper was on the table as quickly as possible. This entry was written by ~~Rhonda, posted on February 3, 2009 at 8:39 am, filed under cooking and tagged "accordion potatoes". Bookmark the permalink. Follow any comments here with the RSS feed for this post. Post a comment or leave a trackback: Trackback URL. “Cool” is pretty high praise.